The economy of Tajikistan is fragile and uneven. Since independence, Tajikistan gradually followed the path of transition economy, reforming its economic policies. With foreign revenue precariously dependent upon exports of cotton and aluminium, the economy is highly vulnerable to external shocks. Major crops cultivated in Tajikistan are cereals (mainly wheat), potatoes, vegetables (mainly onions and tomatoes), fruits, and rice. Cotton makes an important contribution to both the agricultural sector and the national economy. Cotton accounts for 60 percent of agricultural output, supports 75 percent of the rural population, and uses 45 percent of irrigated arable land. More than 80% of the 8,800 square kilometers of land in use for agriculture depends on irrigation. About 5% of Tajikistan is wooded, mainly at elevations between 1,000 and 3,000 meters. No forest region is classified as commercially usable; most are under state protection. Wood production is negligible, but local inhabitants harvest non-wood forest products. Tajikistan has rich deposits of gold, silver, and antimony. The largest silver deposits are in Sughd Province, where Tajikistan's largest gold mining operation also is located. Russia's Norilsk nickel company has explored a large new silver deposit at Bolshoy Kanimansur. Tajikistan also produces strontium, salt, lead, zinc, fluorspar, and mercury. Uranium, an important mineral in the Soviet era, remains in some quantity but no longer is extracted. Fossil fuel deposits are limited to coal, of which about 30,000 tons are mined annually. Tajikistan's extensive aluminium processing industry depends entirely on imported ore. 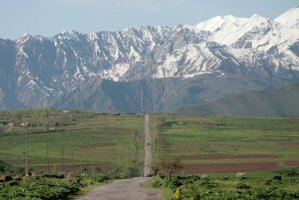 In Tajikistan, aluminium and cotton account for over 75 percent of exports. The top export partners of Tajikistan are Turkey, China, Kazakhstan, Greece and Russia. With foreign revenue precariously dependent upon remittances from migrant workers overseas and exports of aluminium and cotton, the economy of Takikistan is highly vulnerable to external shocks. Tajikistan has one of the lowest per capita GDPs among the 15 former Soviet republics. Tajikistan imports approximately 60% of its food, mostly by rail. The country remains strongly dependent on Russia, both for its economy and to help counter security problems. 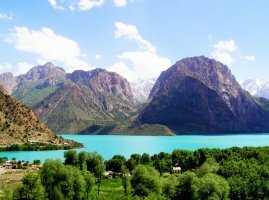 Tajikistan is also expanding its ties with China: Beijing has extended credits and has helped to build roads, tunnels and power infrastructure. Chinese firms are investing in oil and gas exploration and in gold mining. Tajikistan joined the World Trade Organization (WTO) in 2013, becoming the 159th country to join the organization. Tajikistan mainly imports alumina for aluminium production, energy (electricity, natural gas, petroleum and petroleum products, consumer and capital goods, grain, flour, knit men's suits. Tajikistan must import grain from Kazakhstan and Uzbekistan. Tajikistan's main import partners are Russia, Kazakhstan, the European Union, China and Ukraine. Tajikistan is a mountainous landlocked country situated in Central Asia, bordered by Afghanistan, Uzbekistan, Kyrgyzstan, China and Pakistan (separated by the narrow Wakhan Corridor). The country is a member of the Eurasian Economic Community (EAEC), General Confederation of Trade Unions (GCTU), World Customs Organization (WCO), WTO (observer) and other international organizations. Before the customs clearance process the importer has to present samples to Tajik standard to obtain a compulsory quality certificate confirming the adequacy of the imported goods with the Tajik technical norms and standards. It usually takes between one and two days to obtain the certificate. The same procedure should take place as regards the sanitary or quarantine certificates, the telecom and industry quality and standard certificate. Then all required certificates and documents are gathered and joined to the customs declaration. The documents may be required to be translated in Russian by the customs service. One copy of the declaration is dedicated to the importer, one copy to the customs terminal, one copy to the customs statistics department. Usually, one inspector from the clearance post carries out the documentary and physical control. Another inspector of the regional payment department carries out the calculation of duties and taxes and the payment collection. The customs declaration is filled in by the declarant till the break down of the duties and taxes to be paid. The computation and calculation is left to the responsibility of the customs inspector of the payment regional department. To promote economic growth, Tajikistan adopted an export-oriented policy,with the adoption of the resolution on foreign trade liberalization in the Republic of Tajikistan of 27 June 1995 and the resolution on liberalization of currency and export operation of 24 February 1996. In addition, the Government provides exporters with trade information services and implements programmes to promote exports. With the exception of some strategic goods, approval is not required to export goods from Tajikistan. The quota and licensing system in Tajikistan was eliminated effective 1 February 1996. However, some strategic export products, including cotton, aluminium, rare metals and dual-use products, still require Government licensing. Apart from the general requirements that export goods must meet, exporters of some goods are required to meet technical standards, provide certification or obtain special permission. The Ministry of Economic Development and Trade determines which export products are subject to special requirements. There is no formal export tariff in Tajikistan. Since 1 March 1996, all export activities have been exempted from customs duties. As a result of a Government decree, all hard-currency profits earned by exporters are tax-free, except for those related to cotton and aluminium, which are subject to sales taxes of 5 per cent and 25 per cent respectively. According to article 65 of the Customs Code, documents for customs clearance can be presented in a foreign language known and understood by customs officials, if approved by the authorized body on customs affairs. The mandatory sale of certain goods through the State-owned Tajik Universal Commodity Exchange represents a kind of export restriction. The types of goods subject to this requirement, which include all major export products, such as cotton, aluminium, precious and semi-precious stones, ores and metals, are mandated and subsidised by Government of Tajikistan agencies.